A burner at the University of South Carolina, Johnathan Joseph was reputed to run the 40 in some 4.3 seconds. He was only a starter as a Senior, notching 55 tackles and 4 interceptions. It was still enough to entice the Bengals who needed a defensive back in the ever increasing arms race occurring in the AFC North, who selected him with the 24th pick of the 2006 draft. While he didn’t make his first interception until 2007, J Jo was a pass defensed monster, raking in 20 PD in 2006. 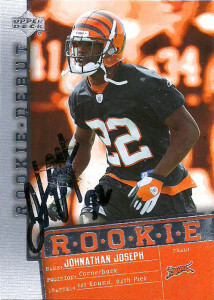 In 2009, Joseph had a career high 6 interceptions for 92 yards, 20 PD, and a TD. He continued to play for the Bengals through the 2010 season. After a disastrous defensive campaign in 2010 that resulted in the release of defensive coordinator Frank Bush, the Texans decided to beef up their defense. New coordinator Wade Philips needed to sorely retool the secondary for 2011. They courted former Raider Nnamdi Asomugha who was considered the most complete man to man defensive back in the Free Agent pool, but he was too much for the team to afford. As Asomugha signed with the Eagles and the Texans’ fanbase groaned, GM Rick Smith decided to go with what they had characterized as ‘their plan all along’. Going for value, Houston was able to get both Johnathan Joseph at corner and Danieal Manning at safety- and they made it work. The Texans defense went from 30th to 2nd in yards allowed over that one season, and captured the AFC South title for the first time in the franchise’s history. They’d repeat again in 2012 posting a 12-4 record. In both seasons Joseph earned Pro Bowl nominations. The franchise went into meltdown in 2013, but recovered nicely under the tutelage of new defensive coordinator Romeo Crennel in 2014. Joseph remained entrenched at right cornerback and despite some injuries here and there is well respected around the league as one of the best defensive backs. He has 6 career touchdowns in 10 seasons. Johnathan Joseph quickly established himself as one of my favorite players on the retooled Texans defense, always around the ball making plays- something not seen in the Texans secondary since the dying days of Aaron Glenn and the early years of Dunta Robinson. As the Texans have made it clear that they want him to retire a Texan, it has made sense to me that I needed to get his autograph on at least something. The Whataburger Community Player of the Year Event provided that perfect excuse. He’d appear alongside Kareem Jackson, Garrett Graham, and Cecil Shorts as winners of the annual event provided by the burger eatery. The crowd was quiet but as Joseph approached I cheered him on, which elicited a fist bump from him when he got to me at the front. When I got to him for his autograph I told him my favorite game of him was when he blew up the Baltimore Ravens a few years ago, intercepting Joe Flacco for a TD. While I was tempted to go for two, I resisted the greed and was happy with my one and done with Joseph. Worthless fact only interesting to me: The Texans love their South Carolina connection. Since the franchise’s inception the team has had 4 starters at corner who have played for the Gamecocks: Dunta Robinson, Fred Bennett, DJ Swearinger, and Johnathan Joseph.